NewsOne.com is an online news platform serving the African American community - providing news and information from a Black perspective. NewsOne is a destination for original stories, opinion pieces, photos, videos, articles and polls. University of Phoenix supports NewsOne in their quest to help change the lives of students, families and future generations through higher learning. NewsOne strives to strengthen ties with higher education and make positive changes within the African American community by examining the factors that hinder students in order to find solutions to combat disparities. 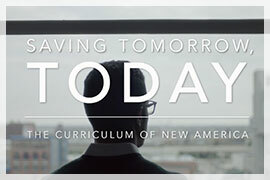 Presented by University of Phoenix, NewsOne’s original documentary, Saving Tomorrow, Today – The Curriculum of New America, examines how educators, creatives and critical thinkers are creatively working to create spaces where marginalized students can grow and succeed. This eye-opening documentary, featuring University of Phoenix’s CFO, Byron Jones, aims to find solutions to America’s failing education system.